I have implemented stereo camera calibration and I can get the extrinsic and intrinsic camera parameter. For calibration I have captured the calibration board with 6-DOF. 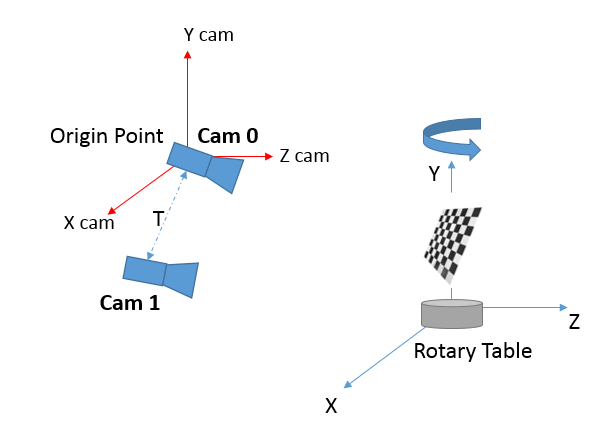 But now calibration board is mounted on the rotary table and I need to calculate the position (XZ) of rotary table respect to the origin point which is camera 0. My question is how can I calculate the normal vector of calibration board? or maybe someone has better solution to get the world coordinate of the rotary table. I googled it but couldn't find something relevant. By "position of the rotary table" what do you mean? Its center? If so, why don't you simply calculate the 3D position of a reference point on the chessboard? Actually the position of rotary table doesn't help me. I need to calculate the vector Y respect to the origin point.